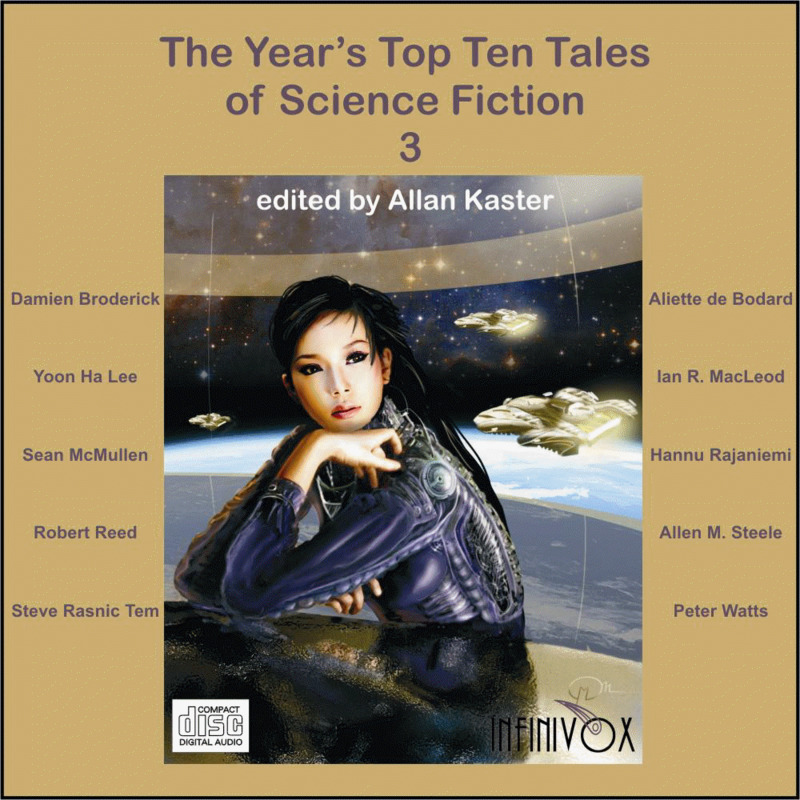 An unabridged audio collection of the �best-of-the-best� science fiction stories published in 2010 by current and emerging masters of the genre, as narrated by top voice talents. In �Under the Moons of Venus,� by Damien Broderick, a man, who has returned to a mostly deserted Earth from a terraformed Venus with Luna and Ganymede as moons, longs to go back to Venus. In �The Shipmaker,� the 2011 story winner of the British Science Fiction Association Award, by Aliette de Bodard, a maker of living spaceships has her career threatened by the birth of a sentient Mind that will come before the ship that will house it will be ready. In �Flower, Mercy, Needle, Chain� by Yoon Ha Lee, a construct meets with an assassin that is the keeper of a gun that erases a victim�s entire lineage to secure the destruction of another gun made by the same gunsmith. In �Re-Crossing the Styx,� by Ian R. MacLeod, an entertainer aboard a cruise ship falls in love with a zombie husband�s Minder and schemes to free her from her marriage. In the steampunk story �Eight Miles,� by Sean McMullen, an English lord hires a balloonist to take him and a nonhuman female to a great height in order to learn the secrets of another world. In �Elegy for a Young Elk� by Hannu Rajaniemi, the gods use a real human to retrieve something important from a city that has become sentient and surrounded by a firewall that protects against gods. In �Alone� by Robert Reed, set in the author�s Marrow universe, a traveler aboard the Great Ship has eschewed contact and remained alone for far longer than seems possible. In the winner of the 2010 Asimov�s Readers� Award for best novelette �The Emperor of Mars,� by Allen M. Steele, a contract worker on Mars becomes enamored with the science fiction retrieved from NASA�s Phoenix lander that arrived on the red planet back in 2008. In �A Letter from the Emperor,� by Steve Rasnic Tem, an imperial envoy visits an outlying colony where a retiring colonel, whose memory is suspect for security reasons, claims to have fought alongside the emperor. Finally, the 2010 Shirley Jackson Award winner for best short story, �The Things,� by Peter Watts, is a retelling of John Carpenter�s classic movie, The Thing, from the perspective of the shape-shifting alien confronting a group of scientists in Antarctica. The stories are read by Tom Dheere, Nicola Barber, Kate Baker, and Nathan Lowell. Running time is more than 8.25 hours on 8 compact discs.